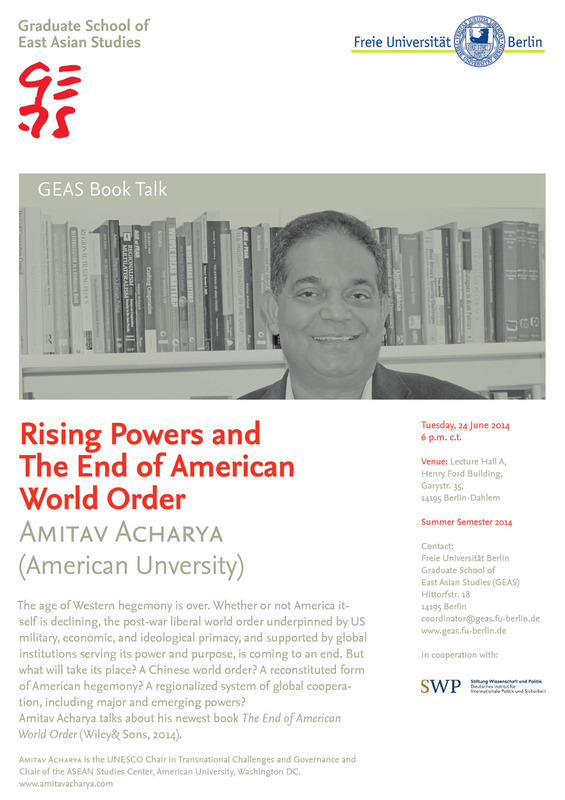 On June 24, 2014, Prof. Amitav Acharya gave a talk on his new book “The End of American World Order” at Freie Universität Berlin. Interestingly, this event took place in the Henry-Ford-Bau, which was constructed (1952-1954) with American funding and where John F. Kennedy gave the programmatic speech associated with his iconic declaration: “Ich bin ein Berliner” in 1963. In the same building, the topic now was “Rising Powers and the End of American World Order”. A timely and provocative talk, as domestic critics in the US, such as Senator John McCain, blamed President Obama’s administration’s “naïve” approach to Russia in the Ukraine Crisis. Also, look at US impotent reactions recently to a turbulent Iraq with the rise of ISIS. As the US can no longer co-opt rising powers to support its own strategies and approaches, Amitav Acharya wrote in The Hindu of May 29th that Ukraine was not so much a failure of Obama’s foreign policy, but a sign of general decline of the U.S. to many outsiders! Generally, Prof. Acharya’s talk deals with a fundamental question of what the world order looks like today, and what it will be in the future. According to the author, the US remains a major force (with its huge military advantage) in the world yet it has been gradually losing its ability to shape the world order. Subsequently, the US-dominated liberal world order is over with the emerging other anchors, including rising powers like the BRICS (Brazil, Russia, India, China, and South Africa), and regional forces (like the AU, ECOWAS, Mercosur and ASEAN) which have become more sophisticated organizations with multiple purposes and expanding functions. In this way, a concert of the old powers (esp. the US) and the mentioned new powers is believed to shape the world order. Instead of following such tags as “multipolar,” “bipolar”, “unipolar,” or “G-Zero” (as Charles Kupchan argued in No one’s world), Prof. Acharya likens the emerging world order to a “multiplex theater”, where movies are showed simultaneously but don’t necessarily share many characteristics. According to the talk, “multiplex” refers to multiple plots (ideas), directors (power), and action (leadership) under one roof, while complex interdependence happens at multi-levels while facing multi-restrictions. The US thus should share with the rising powers its leadership in world affairs. However, I have at least two questions inspired from this interesting talk. 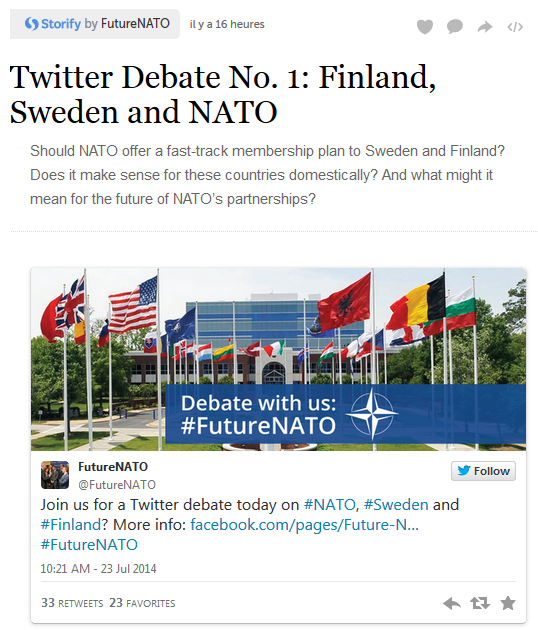 Firstly, where is the EU’s position, or how to see the EU’s role, in the world? Prof. Acharya seems to see the EU as an Old Power rather than an emerging global player with significant overall economic strength, and unique civilian and normative capacities in world affairs and global governance. He argued that the EU has many faces, but can hardly be considered as a real “power” due to its lack of hard power (military forces, assets and let alone strong political wills). Many of the EU member states also joined NATO, and even today they don’t want to or can’t develop credible security capabilities. Prof. Acharya also pointed out EU weakness in responding to the recent crisis in Ukraine, which the emerging powers (like the BRICS) don’t see as a global problem but one of Europe and Europeans, nor do they care about it. This negative view of the EU seemed a bit confusing to the audience of Acharya’s talk of “Rising Powers and the End of American World Order”. While emphasizing the emerging regional organizations like the AU, ASEAN, and their growing roles, the EU as the model of regional integration and most mature regional organization (even with common foreign, security and defence policy) is somehow humbled by the emerging other regional powers!? If the EU is categorized as one of the Old Powers (along with the US), that means the world order so far is not purely dominated/shaped by the US alone. If the EU is seen as one of the many emerging powers (actors), it has also benefited from and been challenging the “American World order” after WWII. So, what kind of power (actor) is the EU in the current and future world order? Related to the first one, my second question concerns an old and new debate of “power” in IR theories. What does “power” really mean in the 21st century, especially for political scientists? Is there a commonly accepted evaluation standard of power, for example, the number of military troops as one of the physical and visible power resources, enjoyed by different actors in the world? And if so, what about those non-physical and invisible resources of power, like ideas, strategies, political will and international legality of different actors? It is commonly believed that an actor’s power refers to its ability to achieve desired outcomes, which depends on not only physical assets like national population, economic wealth, natural resources and armed forces, but also whether and how an actor can mobilize these assets to achieve its various goals in different context (concerning time and areas). That means, power is not simply a static matter; it is also about dynamic process and consequence. According to Joseph Nye, converting assets into outcomes is a process in which politics and strategy regulates how power can or should be exercised, with what assets, for what goals and in what context as well as possible back-ups once failing to produce desired “power”/ “influence”. This said, if the world order is like what Prof. Acharya called the “multiplex cinema”, it might be good to bear in mind that there exist different levels of power assets among the large number of Old and New powers (actors), even between the US and the EU; more importantly, who can give a definite statement that all the new rising powers, or just the BRICS, would work jointly for a common goal to overturn the “US-lead” or American world order, and by using what kind of power? And will the rising powers compete among them for more power out of individual interests? 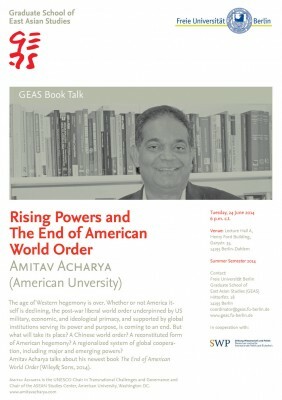 Amitav Acharya’s “The End of American World Order” is not an American-centric analysis of the 21st century world order. At the same time, it not anti-American, either. But it’s very likely that his arguments serve as good food for thought to policy makers and academia about US hegemony/leadership, and any alternative order for global peace, stability and development. Prof. Acharya warned in his presentation that no single rising power would be able to replace the US to dominate or lead the world in the short and even medium- term. Previously he made a similar argument in “Can Asia Step Up to 21st Century Leadership?”. He suggested “sharing leadership” for the US to face the rising powers in the “multiplex” world. But questions come up again, what is “leadership”? Does the US really want to share its leadership with others, who would also like to shoulder their part? And if so, to what extent will a sharing be like? It’s hard to tell; maybe we could just quickly think about the EU and the US within the NATO: is there some “leadership sharing” in effect? To conclude, Acharya’s “The End of American World Order” is worthy to put on desks of policy makers; but his prescription and suggestion (leadership sharing) may be unlikely to persuade them. What I would argue, finally, is that leadership is more of a soft power consisting of elements like values, norms, culture and policy, and it can shape the global governance framework rather than change the world order on its own. Soft power does not always work well for an actor if without backups such as hard (military) power, and more importantly strategic thinking. Therefore, a comprehensive understanding of “power” in today’s world needs to be developed, and it’s better to bear in mind that “leadership” and “sharing” are two things that might not easily happen together. In this way, terms like “American world order” or “multiplex” or any other alternative to label the world are not what people really care about. It’s “power” (in complete sense) that shapes and decides the fundamental structure of the anarchic international system, on which the world is based to appear in some “order”. Yes, both the US and the rising others enjoy their resources of power, but usually politics and strategies determine under which context (when, how and why) these resources are used. History has, and will continue to witness the process of how “power” defines and decides world order. Jizhou Zhao is a Research Fellow at the NFG Research Group “Asian Perceptions of the EU”. Further inquiries are very welcome. Jizhou would like to thank Olivia Gippner, from whose input this blog post benefited.